From the Japanese word is ‘Seiri’, the first step in the 5S System is sort. In a 5S System the goal of the sort step is to remove everything from the workplace that is not needed to do the work. You organize what is necessary and dispose of or put in place what is not. With all the clutter removed the workplace will be cleaner and more productive. By this time you have prepared your 5S System plan and have established your 5S team. If not read How to Plan a 5S System Launch. Before you start take pictures of workstations before and again after the sort so you can post them on your 5S bulletin board. The pictures can be used to sustain the 5S System as examples of the improvements. If your workplace is large such as several warehouses you should divide them up into manageable sections and perform the sort event on different days. The first sort event can be a massive undertaking and you will want to complete it with as little interruption to productivity as possible. Sorting begins with a red tag event. Members of your 5S team will go through the workplace and attach a red tag to anything that is not needed at a workstation and remove it to the sorting area. As a rule of thumb anything that has not been used in the past 30 days should be removed. A red tag does not mean an item needs to be thrown away it just means an item is not needed where it is. Out-of-place items should be tagged and removed. They can be put where they belong once they reach the sorting area. You can buy red tags, Amazon sells them 5S Red Tags – Individually pre-wired or you can create your own tags. Obviously the tags do not have to be red either. The tags should be large enough to be written on and have a string or wire so they can be attached. Have tape ready for items that you can not tie a tag to. A log book where you will note the tag number, a description of the item, the location of the item, and the final disposition of the item. A designated sorting area where red tag items removed from a workstation can be put until their disposition is decided. Boxes or totes are useful for transporting small items such as from drawers and cabinets. Rather than tag each small item place items for a specific area such as a desk into a box and tag the box. Now that the 5S team is armed with the tools they need it is time to start the sort event. If your 5S team is large enough assign team members to work the sorting area. If not work the sorting area after your team has gone through the workplace tagging and removing items. 5S team members should move from workstation to workstation tagging items and removing them to the sorting area. Fill out every tag as noted above before the item is removed from the workstation. All drawers and cabinets should be sorted by those who work there with the help of a 5S team member. The goal of the sort event is to clear the workplace of anything that does not belong so be ruthless when tagging items. If there is any doubt that something is used ask the employee who works in the area to find out if an item is needed. Some employees will be resistant and want to keep items not needed. When this happens management must step in to remove the item and avoid conflict. During the sort event look for any obvious safety issues and resolve them immediately. You may find frayed wires or leaking equipment that was covered up. At the end of the sort event each workstation should only contain a small amount of work in progress and the tools and supplies needed to do the work. In the sorting area there are three dispositions rules for red tagged items. Clear the sorting area by following these three disposition rules. Write the disposition of each item in your log book noting the tag number, item description, location the item came from and its disposition. During the sort event have your employees and management come look at both the piles of red tagged items and the newly sorted workstations. Impress upon them that the red tagged items represent a waste of time and money. How often a sort event is needed depends on how successful you are with the 5th step in the 5S system, Sustain. A properly implemented and monitored 5S System will limit the need for 5S red tag events since sorting is already built into the system. Part of the daily work routine is to sort through and remove anything that is not needed from the workplace. Even with the best 5S System items will accumulate and you will need to have another sort event. I find the last Friday of each month is a good day to hold a sort event. At the end of each sort event the 5S team and management should meet to review the event. If you found excesses of parts or supplies you should look at your ordering system. Consider implementing a Kanban flag system to improve inventory management and cut costs. Items out-of-place are a sign of poor organization or a lack of employee discipline. Review the log book for items out-of-place and create an organizational system that can be posted and shared with everyone indicating what goes where. This will also help in the next phase in the 5S System which is the straighten step. Had a chance to learn the system from Japaneese experts it is really workable system. Your article is simple and great, I really appreciate you in writing such elaborated artcles, I really appreciate you in finding the exact english terms great. 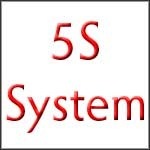 I would like to be in touch with the society who is interested in implementing 5 S systems.